Pipe Shoes for Saudi Arabian Oil Company | Piping Technology & Products, Inc. 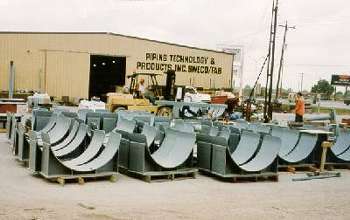 This photograph shows a number of 60” pipe shoes fabricated by Piping Technology & Products, Inc. of Houston, TX for export to Saudi Arabia. The Saudi Arabian Oil Company is purchasing a variety of sizes of this type of shoe and other items required for piping on their projects. Piping Technology furnishes all types of pipe supports including PTFE, 25% glass filled, and graphite slide plates, anchors and insulated pipe shoes. Want to learn more about pipe shoes? Learn more from one of our previous webinars!